** Graphs are created using Fuel Model G (Short Needle / Heavy Dead) as the representative fuel model. Graphs are posted Tuesday and Friday from March to October and Friday only from November to February. For more information on when charts are posted, contact SWCC Intelligence Operations. What is the Energy Release Component (ERC)? The Energy Release Component (ERC) is based on the estimated potential available energy released per unit area in the flaming front of a fire. The day-to-day variations of the ERC are caused by changes in the moisture contents of the various fuel classes, including the 1,000 hour timelag class. The ERC is derived from predictions of (1) the rate of heat release per unit area during flaming combustion and (2) the duration of flaming. How are the Graphs used? All wildland protection agencies are directed to protect life, property, and natural resources entrusted to them. These requirements dictate strict attention be paid to the availability and use of suppression resources. In the Southwest Area, the Graphs are averaged over 3-day periods. They are primarily used to look at the seasonal trends, a comparison tool against previous years, and as one tool used in determining the Area preparedness level. Each chart displays the current year BI or ERC values relative to the average for a 25-year period, the average of the highest values during the same period, and when the values reach the 90th and 97th percentiles. The Graphs are not designed to be site specific, they provide only a general picture of how conditions are currently and how the season is progressing in the Southwest. Units throughout the SWA produce their own local, site specific chart(s). The Graphs are only one of the components used in determining the SWA preparedness level. Other components that must be considered include; (1) current and long range forecasted weather affecting current and forecasted fire behavior/potential, (2) resource committments to incidents, (3) individual agency fire reports, (4) National Preparedness Level, (5) air quality considerations, and (6) fire suppression resource availability. The breakpoints in which the ERC Curve is used to assist in determining the area preparedness level are indicated by lines drawn horizontally (i.e. PL-2, PL-3, PL-4) on the chart. The 90th corresponds to the "very high" adjective reading and the 97th percentile corresponds to the "extreme" adjective reading. How are the State and Area-Wide graphs generated? 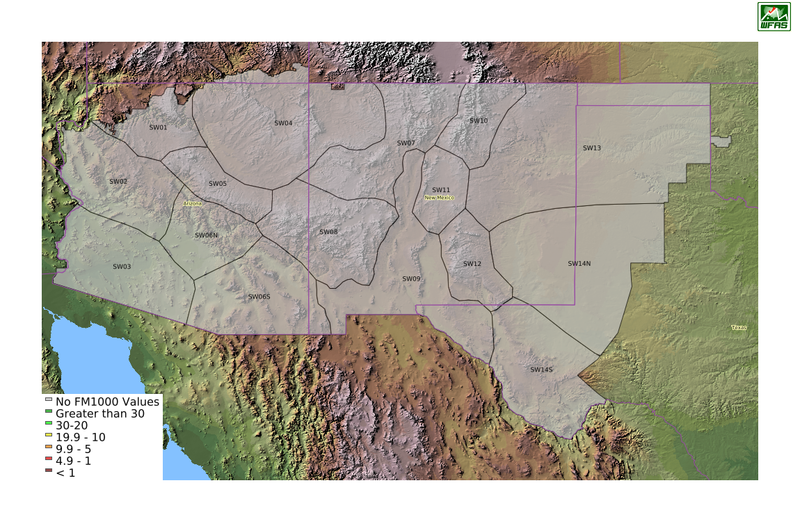 The State and Area-Wide graphics are derived using data from 12 Automated Weather Stations (AWS) strategically located throughout the National Forests of the Southwest Area. Each day around 1400 local time, this data is uploaded via satellite to the National Weather Information System (WIMS).